To support the cinema release of Illumination’s The Grinch, Universal were looking for a disruptive brand partnership that would engage a millennial audience and create stand-out from the standard Christmas campaigns. The run-up to Christmas is a time of year that can make people grumpy about their finances. So Brand Culture approached Yolt, a smart thinking money app from ING Bank encouraging people to think differently – and more positively – about money. 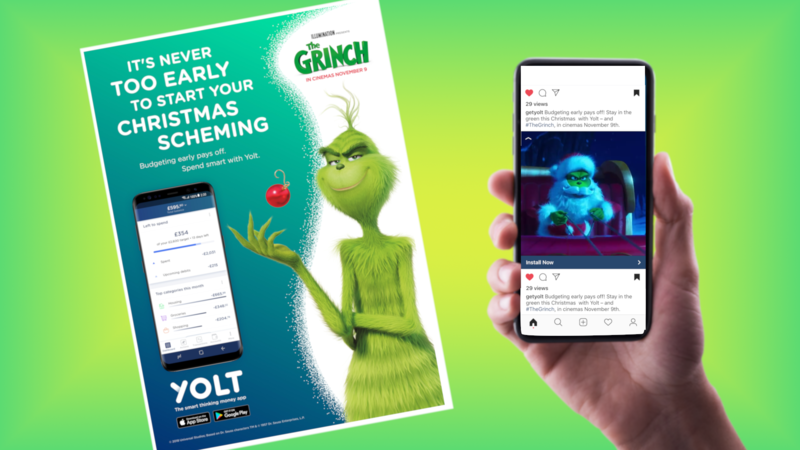 Through a series of comedic clips featuring the Grinch on Youtube and Facebook, Yolt were able to promote their app features and benefits in a fun way by drawing on the typical things that can put a frown on people’s faces at Christmas. The chance to win a Grinch themed trip to Finland to see the Northern lights was also promoted on social media and via Yolt’s newsletter to further engage the target audience. For Yolt, the campaign was hugely successful in helping build brand awareness, with strong figures for view-through rates on Youtube. It was also their most successful social give-away prize draw. The film went on to significantly outperform its Christmas competition.